Trust and honesty are scarce in today’s world. When we meet a new person, we are not sure if he or she is telling us a truth or lie. How can we trust someone if we identify a symbol of lies in the conversation? You think that there are some obvious signs of liars, like the nervousness. 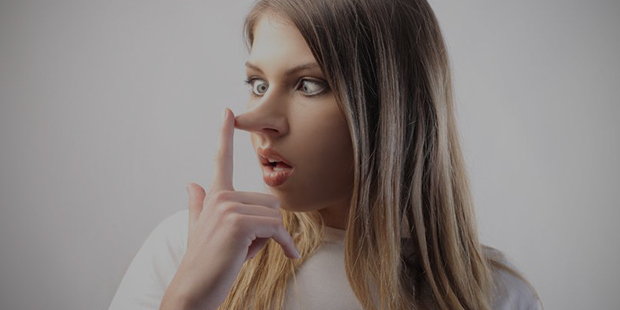 You can easily identify distress on the face of the first-time liar, but some people are lying from ages. They are habitual liars and don’t fear getting caught, and some are great at hiding face expressions. Still you can catch the liars by closely analyzing their behaviors. They may hide their nervousness, but their body language reveals a lot about what’s going in the head. Watch closely at their body language. When someone lies, he moves his head quickly, like jerking up and down. You will also see a change in their hand and arms movement. Some people can hide the nervousness on their face but not at their feet. Secretly look at their feet if they are frequently shuffling their legs or feet. It is difficult to hide all the symbols even if someone is an expert in lying. You will see a change in their breathing pattern when they speak. Their heart rate goes up, and there is a slight change in their blood pressure, that impacts the breathing. That is a symbol when you should become suspicious of a liar. They do not feel comfortable in answering quickly. They take more time in thinking before they utter the first word. They pause in between in the answers. You may not find nervousness in their voice, but they will hesitate in giving detailed answers. The liars often touch or cover their mouth while speaking. Watch out for the symbols. They become more impersonal, as a result, liars often reduce the number of times that they say words such as “I,” “me,” and “mine,” and use “him” and “her” rather than people’s names. The liars also provide more information than asked. This behavior also happens when the liar lack of authentic information to back up his claims. To hide the true information you have to provide a lot of false information. Isn’t it? A nervous person blinks a lot, but a deceptive person blinks less. Science says that we blink less when we concentrate on something. Think of a situation when you solve a mathematical problem, your whole focus on mental calculations that increases the load on the cognitive system. People don’t blink when they are focused on making something in their minds like the liars do when you are talking with them. The liars move their head, arms, hands, legs and hands than normally. When they focus on thinking about faking sentences they repeat the same phrases, give shorter answers but talk more about an unrelated topic. They hesitate answering the questions in a meaningful way, that results in taking longer before they start to answer. They blink less when listening to you; they stand still and avoid the longer discussion.